Plot/introduction: You are a student at Golden Mist Military Academy, one of the most prestigious institutions of in the Sonniet Empire. It is located just off the continent of Torgeth on floating island of Ctlethni. Students from all protectorates of the Empire come to Golden Mist Academy to prepare for entrance into the Sonniet military and earn favor from the royal family of the palace Resorondal, the seat of the Empire. Recent endeavors to expand the reach of the empire has lead to an increase in the importance of the academy and the social status of those who excel in their studies. What distinguishes Golden Mist from lesser academies is the field experience. Every year before graduation every Senior honor student is assigned a unit students to lead on an invasion into enemy territory. It is currently the final weekend of spring break and students are eagerly returning to campus waiting to see where and with whom they'll be assigned. 3) We reserve the right to kill anyone and everyone if they do something blatantly stupid to put their life in danger. Any character whose life is inadvertently put in danger by another player will most likely be spared. 4) PC's must be enrolled in the Academy as a student. You can play a senior but only GMs can play unit leaders (senior honors students). Characters should either be under or just passed the adult age of their species. 5) Characters powers and abilities must be reasonable. Use this bio or any other found here as a baseline for capable but not overpowered. 6) Bios that were prepared before may be used, but alteration may be required to fit in with the the world and it's lore. 7) As a general rule, the Hyranian races are off limits. The Hyranian races are listed for reference during the rp. Npcs on Hyrania can belong to one of the Hyranian races. Nymphs may be considered with an explanation on why they are at the university. Magic and technology are fairly commonplace in the world in this era but some countries are noted to prefer one or the other. many places that prefer technology will shy way from magic and vice-versa but there are some realms where the two are equally disliked or embraced. magi and technology do not necessarily oppose each other, the matter is more fa preference by the user rather than having anything t do with the nature of the skill sets themselves. Magic can achieve surreal effects or more easily achieve some of the effects one would gain with technology but it will drain one of their energy and hence it cannot be performed for extended periods of time. technology on the other hand allows for he building of factories which takes a good deal of energy to build but can then run on wood,col or some other energy source to produce a desired effect without much effort. The question between technology and magic is usually a question of effect and the amount of energy you are willing to actively put into each task along with how steady the process is desired to be.. I'm definitely joining this. Here are my characters from last time. I doubt I'll use either of them though. I have two other character ideas, one of which I am currently working on. They'll take a while though since I am trying to work within the rules of your world's magic. I can almost guarantee that I'll only use one character even if you let people do more than one despite all the ideas I have. I just really love character building. appearance: Irile is slightly above the average height for a female human standing 66 inches tall. At 155 pounds She is a bit heavier than most girls her age and height from embracing her natural stockiness rather than obsessing over obtaining an ideal state of thinness and intentionally putting on some muscle mass. Most of her muscles do not bulge but are still faintly visible without flexing. Her thighs and calves are the exception having both visible tone and definition without being off-puttingly large. Her body is not lacking in fat, but she is content because most of it resides in what she considers desirable locations. Her hair is silky and straight with a dark brown shade that can be mistaken for black in poor lighting or when her hair is wet. It is cut to shoulder length. She normally wears it pulled back in a thick pony tail with bangs left free to frame the side of her face. A strand is dyed dark red and kept to the right side. Her eyes are a vivid pale blue with a small grey ring around the pupil and a dark blue line around the outer edge of the iris. Her skin is naturally pale and she has spent hours outdoors just to earn a tan so slight that you would only recognize it as such if contrasted to the porcelain white skin hidden by her uniform. She has a small pointed nose and a pointed chin. The rest of her face is well rounded and her cheeks are somewhat chubby and lightly blushed. She has long thing lips of a pale pink color that tend to twist into a crooked smile. In addition to the normal school uniform she wears dark brown bike shorts that go down an inch below her uniform length skirt. She wears a leather belt with ammo pouches and a pistol holster. She most frequently carries 2 Uzis. These guns have collapsed stocks and use 32 round extended magazines. She carries enough replacement clips for about 30 seconds of full auto fire from both guns not counting reload time. The SMGs are kept in twin shoulder holsters. She keeps a Swiss army knife on her person. As a backup weapon she wears a 1982 desert eagle holstered to her hip with two extra clips of ammo. She carries two orange foam earplugs that she puts in whenever she has the opportunity to before firing and often forgets to take them out. She has protective goggles that she wears around her neck or on top of her forehead when not shooting. They are black and the lenses have an orange tint when viewed from the outside. They provide little to know protection from UV light but the hard plastics can stop dangerous projectiles such as a ricocheted mythril bullet, once. All her ammunition is made out of a mythril alloy. In her room she also has a locked closest that contain an assortment of rifles and shotguns. She also has a locked chest with extensive amounts of ammo and a gun repair and maintenance kit. gun nut: Irele knows everything there is to know about guns: their history, how to clean them, how to take them apart, proper safety, and of course how to use them. She can identify most makes and models on sight. She prefers automatic weapons but is capable in the use of virtually all firearms. Her ability to fill the role of a sniper is limited more by her lack of focus and patience than any lack of skill. athletic: She is in great physical shape. She is slightly stronger than the average female of her size. She is flexible and has a good sense of balance. She is both a great sprinter and long distance runner. 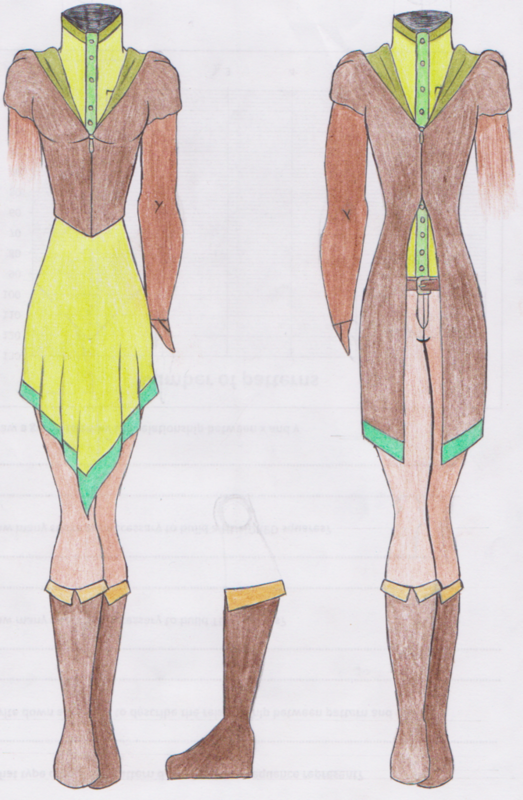 magical abilities: Irele has focused her magical training in augmenting her body and weapons. Force Reduction: Irele can break newton's 3rd law. She can cancel out the opposite reaction without having an effect on the other. The main application of this is recoil free gunfire. It can also be used to diminish the impact of physical blows and falls although she is limited to how much force she can remove from a given action. For example a collision with a train or a 100 foot drop would still kill her outright. At full power she could reduce the force of a punch from a professional heavyweight boxer to the force of a punch from a professional middleweight boxer. CPU upgrade: She can hypercharge her brain which greatly aids her with multitasking. This allows her to aim at two separate targets at once without the loss of accuracy that normally comes with any attempts of dual wielding weapons. The benefits of this only apply to multitasking. For example she could use it to solve two long division problems at once, but not to solve one faster than normal. Extra mag: When out of bullets she can create bullets made of compressed magical energy. These bullets disintegrate as they travel making them less effective at medium range and completely useless at long range. She can only muster enough energy to two guns full auto for about 30 seconds with her current abilities. Land strider: By magnifying the force generated when her legs hit the ground Irele can greatly increase the speed and distance of her jumps, briefly allowing her to reach the speed of an automobile. Using this ability can put strain on her legs to the point of severe fractures if the force is too strong or applied to frequently. Railgun: By creating an electromagnetic pull around the barrel of a gun Irele can hyper accelerate a bullet as it leaves the chamber. The increased speed of doing so increases the damage of the bullet and increases how far it can travel before gravity starts to take effect. Becomes incredibly energy inefficient when used with automatic fire because doing so requires continues magical exertion instead of applying the effect for a fraction of a second. Weaknesses: Besides her magically enhanced mobility (which comes at a price) Irele has no defensive capabilities. She also has few options for close range encounters and is defenseless once she empties her ammo reserves or if she is caught without her guns. Between her earplugs and the sound of her weapons she has a difficult time hearing orders and approaching danger during combat. History: Irile comes from one of the most technologically advanced countries in the empire when it comes to weaponry. Her country is also known for shunning magic more than nearly anywhere else. Her settlement valued ingenuity and physical prowess in addition to personal freedom and ambition. She was obsessed with power and things that bring power (weapons and money) from a young age. She had always dreamed of getting into Golden Mist to prove herself. To her ecstasy she excelled in the combat oriented curriculum and extracurriculars of the academy. She was even one of the few freshman selected for the field practicum last spring where she was part of a wildly successful unit. appearance: At four feet seven inches tall the top of her head fits neatly under the chin of a female human of average height. She has dark almond colored skin, which to her father's shame advertises that their fire elf bloodline was at some point muddied by having a wood elf ancestor. Her skin is soft and smooth. It is also extremely warm to the touch. Being close to her feels like standing next to a campfire or laying on a hot rock. The coloration of her hair, like that of her her skin, shows signs of a mixed heritage. It is a dark red falling between light and medium auburn on a hair color chart. She recently got her hair done in a bob cut. Her forehead is completely covered by hair that is brushed down and to the side in layers. Her hair is soft and smooth with a healthy sheen. She has a small rounded nose and large round eyes that would look more fitting on a sprite than an elf. Her face is heart shaped and her cheeks are plumped like those of a child. Her body is lacking muscle as one would expect of an elf, but she does not quite fit the slim build stereotype. Her entire body is coated in a soft thin layer of baby fat, or at least many would call it that if not for her age. The only aspects of her appearance that would betray her adult status would be her moderately well endowed chest and backside, which is almost entirely concealed by lose clothing, and her height which is average for her race and gender, but she looks shorter than she actually is at most times do to her posture. She keeps her head and shoulders lowered at almost all times. These traits have lead to her frequently being mistaken for a freshman, and more than once being mistaken for a middle or even elementary school student when out of uniform. She is sometimes even mistaken for a young boy because of her short hair. Her uniform is baggy and her skirt is much longer than standard regulation reaching well below the knee. She wears long boots and brown stockings underneath her skirt. equipment: special clothing that can withstand temperatures up to 1000 degrees Kelvin before burning. A fully stocked first aid kit, a 1 liter canteen of magically enhanced water. Drinking the water boosts energy levels, provides minor heat resistance, boosts the immune system, and slightly increases the natural healing process for several hours in addition to the obvious effect of combating dehydration. Type B Translator: In addition to speaking Elvish and the common tongue, Janiel is able to understand and speak draconic. Heat immunity: She is not effected by abnormally high temperatures. She cannot be burned or suffer from heat strokes or any other ailments associated with overheating. Cold Resistance: Even though her body temperature is much higher than humans it can drop just as low before becoming fatal and her body is better at maintaining homeostasis. As such she can withstand much more exposure to the cold before succumbing to negative effects. Poison and disease resistance: Her elevated internal body temperature kills pathogens and causes poisons to break down at a fast enough rate that she is unfazed by all but the most virulent poisons. Spell efficiency: She is strongly attuned the element of fire and gets massive mana cost reduction when casting fire aligned spells. Tempest: an elusive mental state where Janiel finds resolve and loses all inhibitions. In this state she cannot use extinguish or any of her non-offensive spells. The power of her offensive spells are greatly magnified in this state. Combat medic: Janiel is well versed in emergency medicines and is capable of tending even serious wounds without the aid of magic. Healing without magic is more time consuming than magical healing and may be insufficient to save people on their deathbed. Field Knowledge: despite never being in the field Janiel is well versed in the history of war and numerous military strategies and principles and theories of war making. Fire imagery: She can make and control moving images of flame that look like a painting or movie. These constructs are strictly two dimensional. Touching them directly will cause minor burns and even severe burns if contact is maintained with them. singe: can use heat to burn text or pictures onto paper and other objects. dehydrate: removes moisture from objects through evaporation. Primarily a utility spell but it can be used in combat to make objects more easy to ignite, or even dehydrate living creatures to the point of death. Warmth: soothes pain and greatly accelerates the healing process. Requires exposure to the source of warmth, the greater the distance the weaker the effect. Can either be casted continually from the hands or used to create a floating orb that disperses the effect over a set amount of time. Can not heal burns. Fever: Casted from the hands in a fashion similar to warmth. Fights off disease and breaks down poison by increasing the body heat of the target. Only useful when the danger posed by the disease or poison is greater than the damage raising a creatures body temperature would be. Chill: The polar opposite of fever. Lowers the internal body temperature of the target to prevent overheating. Like fever, overexposure can kill the target. Soothe: Has healing effects similar to warmth. Requires water as a catalyst and is able to treat burns. If using the special water she carries with her she can heal greater wounds and heal them faster than she can with her other spells, but using soothe at all costs much more mana than her normal spells because it does not benefit from spell efficiency. Flash Sweat: Requires close proximity to the target. By using a quick burst of heat she causes the target to sweat profusely providing minor protection against overheating and fire magic. Iron Flesh: Similar in conception to flash sweat. Requires close proximity. By using a quick burst of heat and using the target's sweat to cast soothe she creates a layer of thick calloused skin over the target's body giving minor protection to physical attacks. Snuff: Instantly extinguishes any fire, can be casted on a target or as an area of effect spell. Ignite: starts a small fire, great for lighting campfire and torches. *Combust: a more powerful and offense oriented version of ignite, causes an object to spontaneously burst into flames. *Fireball: launches a ball of fire from one or both hands. Size and heat vary depending on the mana put into it. Anything hit in the explosion has a chance of igniting. **Great Fireball: Nearly identical to fireball but more mana consuming. The insensity is so great that force is released on impact, enough to knock down most adult humans and send them flying several feet if they are in the center of the explosion. ***Great Chaos Fireball: an even more enhanced fireball. In addition to the effects of great fire ball it releases enough heat that the ground it explodes over smolders for up to an hour igniting anything that touches it. Can only be used under the effects of tempest. *Detonate/**Greater Detonate/***Greater Chaotic Detonate: Almost identical to the fireball series of spells. The only difference is that instead of throwing the explosive with her hand she creates a compressed sphere of energy at a focus point that explodes in a fashion identical to the fireball equivalent. The spell can be moved prior to detonating once it has been charged. *Fire breathe: releases a short puff of fire or creates a growing cloud of fire when used over a longer period of time. Despite being named as a breath attack this can be released from the hands or feet in addition to the mouth. **Dragon Breathe: a stronger version of fire breathe. It is more streamlined and has a much further range in addition to burning hotter and having knockback. *Fire constructs: A combat oriented form of fire imagery. She can create weapons and artificial creatures out of flames. These constructs have no actual form, as in when they come in contact with something they only burn rather than slam push or cut. She can control multiple constructs independently. Creatures made of flame are not sentient but her degree of control is high enough to be largely indistinguishable from living animals. *Pillar of Flame: Shoots a column of fire into the air similar to a vertical dragon breathe. **Firestorm: a stronger version of pillar of flame. Multiple pillars shout out of the ground randomly. ***Chaotic firestorm: the ultimate version of pillar of flame. Like other chaotic spells the ground remains smoldering after the pillar fades and anything that touches it will ignite. Only available while under the effects of tempest. *Sphere of flames: creates a ball of fire that extends out from her body. Burns others on contact. **Flame burst: a stronger version of sphere of flames, the sphere extends at a high-speed and produces some knockback in a fashion similar to greater fireball. ***Chaotic Flame Burst: The final version of sphere of flames. As with all her chaotic spells it causes the ground to smolder and ignite objects, and can only be used while under the effects of tempest. In addition to this the flame of this version is hot enough to melt metals. Weaknesses: She represses her offensive abilities as much as possible. She very much dislikes harming others and panics when around conflict. Her combat spells come in 3 tiers. Even the lowest tier can only be used in a state of anxiety or panic, the second tier requires a state of true duress, and the highest tier can only be used under the effects of tempest. Her personality and morals will cause her to enter a state of severe emotional turmoil after leaving her tempest state which will lead to a shutdown where she will become completely useless until she receives treatment. Water and cold spells, or even non-magical cold and water hinder her heat and fire oriented magic. She has no form of self defense besides offense. She is completely reliant on magic for combat. Appearance: Myr has straight, silky almost platinum blonde hair, ice blue eyes and rather young, delicate features. 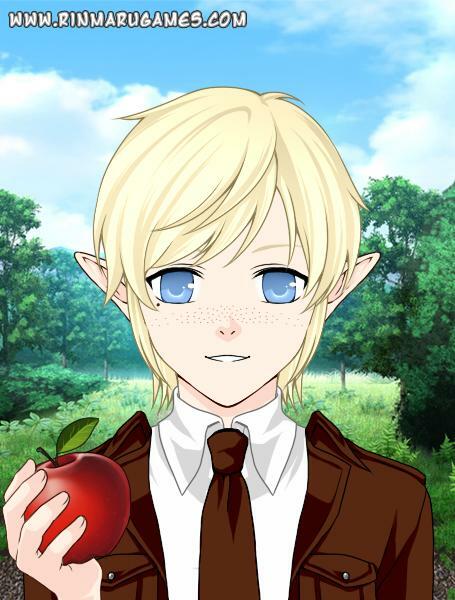 He is handsome like all pure bred elves and is quite athletic which has led to him building up some muscle. Myre's hair is usually kept slightly longer than what the school or his family would like, with an elbow-length tail at the back. A lock or two in the tail is braided. He has freckles and a single mole to the lower left of his left eye. His skin is fairly light, like porcelain, and he stands at about 7.8 feet tall. He also will usually wear a gold circlet though there is a section removed over his forehead. At the back center and at the two rounded ends in front there are small diamonds embedded in the crown. This is the only peice of clothing that is not regulation which he constantly wears with his uniform as a symbol of his status. Equipment: Myr uses a single pistol, a rapier, a bow, two crossbows and a pair of knives along with his various potions. He also has portable holes in several pouches which he often places on or in his uniform. These pouches are used mainly for storing potions and ammunition though one is used to keep a variety of fruit, mainly red apples. He also keeps his book of shadows with him which contains recipes for numerous salves, potions and minor poisons. Finally, he also has a small pocket watch given to him by the headmaster. It is charmed so that it may allow him to contact the headmaster at any point in time (or vice versa) but it will die in a single lunar cycle and will need to be recharged. Skills: Myr is quite proficient in alchemy, being capable of crafting a poison that will induce paralysis for an hour , two minutes after it enters the bloodstream as well as a number of healing and fortifying salves and a single barrier potion which can last for a few seconds. He is able to craft arrows should he have the necessary materials. Myr has also got a basic proficiency with each of his weapons. Magical abilities: Besides his skill in Alchemy, Myr's blood is a healing salve that can last for a few minutes. He also is an untrained sensory arcana, able to understand magical languages and see mana flows though he has a great deal of trouble interpreting them. Myr is capable of forming mana bullets, though he is only able to form one or two a day as he finds controlling mana through sheer will power to be very straining. Weaknesses: While Myr is capable of using a wide variety of skills, he only has the most basic proficiency with many of them and will easily lose to someone who is specializes in a weapon, hence he has trained to hold off opponent while waiting for his team to assist him. His main goal is to assist his allies and thus he focuses on using his different potions to aid them while hindering opponents with adverse effects. History: Myrillian is the second youngest child of emperor Sulleran Soniette and empress Fiassielle Soniette. He enrolled in the Gold Mist military academy with hopes of impressing his father who felt distant from him and so partook in numerous courses to improve his skill and become an asset to the empire. Before enrolling at the school, he lived in a life of almost pure luxury and he is still quite spoilt in that he receives incredibly large sums of money as 'pocket money' which he keeps in one of his pouches. During the holidays before the current school year, his younger sister informed him that she would be starting at the academy at the start of the year hoping he would give her some suggestions on which courses she should take among other things.